I wanted to wait until I actually had the proof in my hands. So, I kept my excitement to myself until now, because now, I have the proof in my hands. 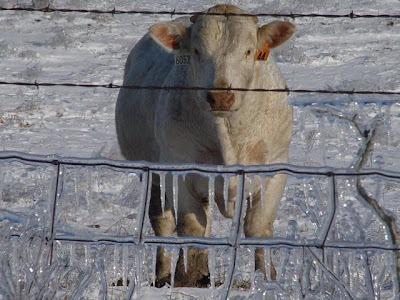 The below photo was taken after the 2007 ice storm in Missouri. The below photo is also published this January/February issue of GRIT magazine. The below photo is my very first paid publication! I didn't get much, and the photo is very small and amongst other readers' photos, but it's still my first paid publication. Here's hoping and praying for many more, since that is my dream afterall. Congratulations! And, yes, I hope there will be many more. well done, Misty! YeeHaw! (I love cows .. it's the big brown eyes, I'm sure.) !!!!! Yay! That's so cool! Here's to many more to come! I love this shot, and the look on his face! Great photo and congrats on your first paid publication. It is very exciting. Congrats! I get Mother Earth but I don't get Grit. Its been on my list to subscribe though. Beautiful photo! Fabulous first, and fabulous foto. Good for you! 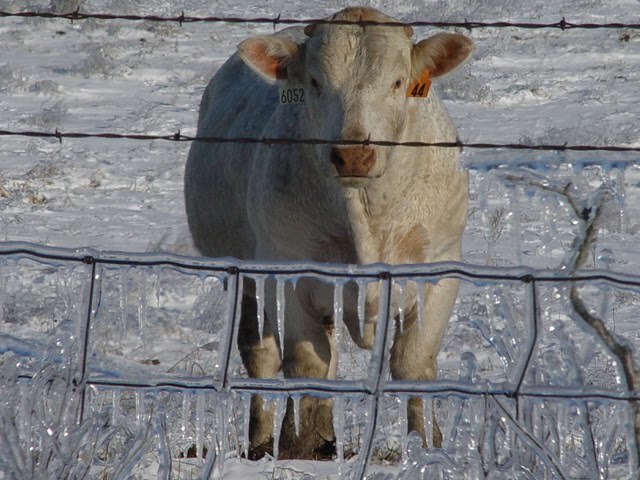 Nice shot of the ice and of the Charolais bull, too. Congrats! That icy fence is incredible!